Pioneer Moi Avenue is located in the Nairobi Central District along Moi Avenue. At Pioneer Moi Avenue, you are guaranteed as you work in the comfort of your office; a magnificent view of the sprawling East Africa Railways Headquarters; the 7th August Memorial Park and the imposing ‘Bellbottom House’ Co-operative Bank all at once. 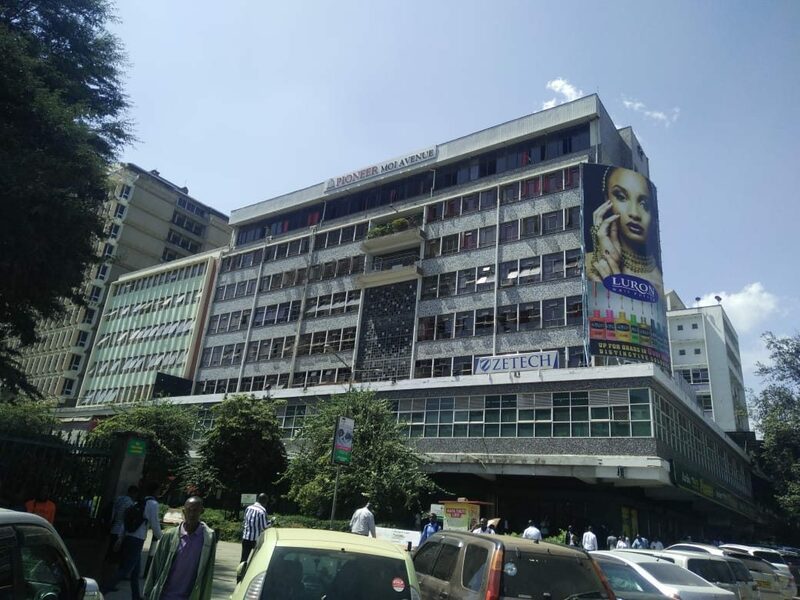 Pioneer Moi Avenue comprises of seven floors of office space housing some of the biggest business in Kenya including a reputable supermarket and a leading Insurance company in Kenya. The property contains spacious medium size shops and offices beginning at approximately 500 sq. ft. and above. Our Group head offices are also located in this building. The property is serviced by a standby generator in case of power black-outs. There is enough parking along the building that is managed by the Nairobi City County. The property has well maintained modern toilets and bathrooms on the facility. Common areas are served by two modern state-of-the-art lifts and two staircases. There is provision for office kitchen services and washrooms. Environmental management whereby the Landlord ensures that cleanliness and all green areas are up-to international standards have not been compromised. Security has been beefed up to ensure the residents are always secure. To ensure more security for its residents, walk through scanners and hand-held scanners are used at the entrance. Security guards man the entrance and constantly patrol along all the floors. Security equipment including fire alarm and security back-up alarms have been installed by a reputable organization. The property is fibre-ready. Tenants in this property include Tuskys Supermarket, Zetech College, and Pioneer Assurance Company Ltd.